Pleasanton publisher Judy Wilkerson is flanked by Sam Keach (left) STPA historian and Chad Ferguson (right) STPA site chairman. Wilkerson and her late husband, Bill Wilkerson, were honored at the 90th STPA Convention by being the namesakes for the Judy and Bill Wilkerson Sweepstakes Awards. 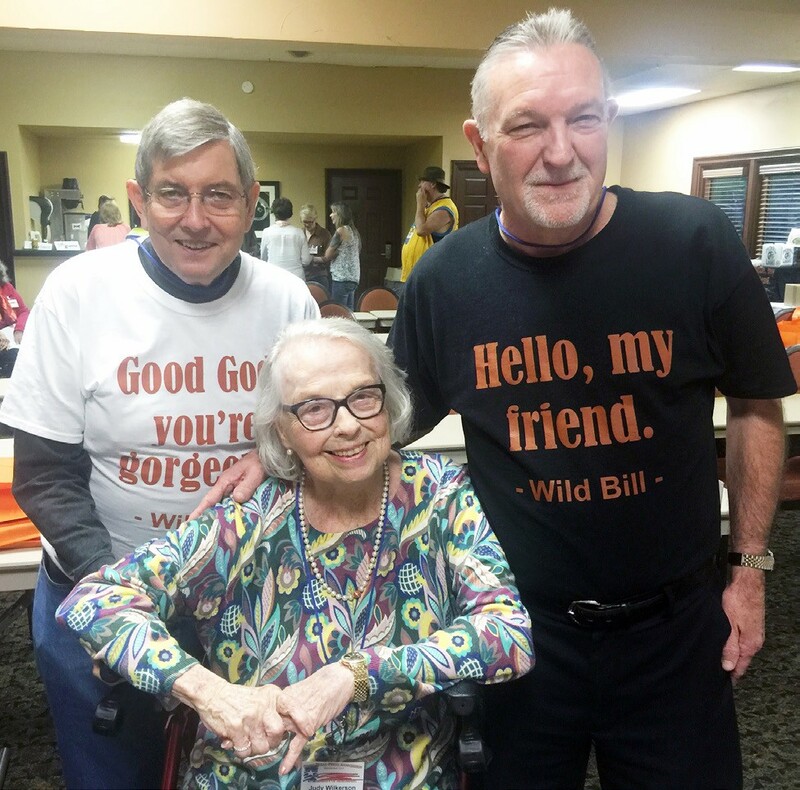 Both men donned shirts with “Good God, you’re gorgeous” and “Hello, my friend” – favorite sayings of Wild Bill when he’d greet his friends. The South Texas Press Association’s (STPA) Better Newspaper Contest awarded the Pleasanton Express eight awards as well as coming in third place overall in the Sweepstakes category in Division 2 (weekly newspaper with a circulation larger than 2,000). Fredericksburg Standard-Radio Post won Sweepstakes with the Port Aransas South Jetty placing second. The Sweepstakes Award has been named after of Judy Wilkerson in honor of their life long service to STPA. Bill passed away April 30, 2015. This award is given to all three divisions who have the most cumulative points overall in the newspaper contest. Noel Wilkerson Holmes, Publisher of the Pleasanton Express assisted with the presentation of the plaques. “Thank you for celebrating my mother and father’s life-long continuous never ending love and devotion to the South Texas Press Association. Their love affair with each other and the community newspaper industry will always be their legacy. The Judy and Bill Wilkerson Sweepstakes award will hopefully keep the stories of all their GLORIES -fun, fairness, friendship, finances and fantastic community journalism alive for decades to come. They will remain forever faithful and passionately in love with it all,” said Noel after the presentation. Placing first were Robbie Hamby in the Humorous Column Writing and Leon Zabava for his News Photos categories. “I found both the columns to be not only humorous but revealing in everyday life and how we deal with trying circumstances in different ways or sometimes not at all. Funny things happen all the way around us but we don’t always appreciate them at the time. Well written, kept my interest throughout,” said Hamby’s judge. In the Page Design category, the Express also placed second. “Good clean consistent layout. Nice use of white space. Sub heads could help take away “gray” look of some inside pages. “A little better inside for page design move to 2nd over 3rd,” wrote the judge. Sue Brown won second place in the Serious Column Writing category and took third place in the Division 2 Editorials. Third place was also given in the Display Advertising category. Winning ads submitted were the Healthy Woman Gala Belle of the Ball,My Kids’ Pediatrician and Pleasanton ISD Football ads. “Belle of the Ball – Simple and inviting. My Kids’ Pediatrician – love the photos showing the steps of the doctor visit – great idea,” wrote the judge. Tying for third place with the Katy Times in the Sports Photos category was the Express team of Sports Editor Chris Filoteo and Joe David Cordova. “The football image is top notch. Great moment, composition and facial expression. Cross country photo – … shot tighter to catch an expression. At least it is a sports photo and not a feature photo like the other entries in this division,” said the judge. The 90th STPA convention was held in Fredericksburg at the Fredericksburg Inn and Suites. The contest, judged by the West Texas Press Association, drew over 400 entries in three divisions, with 31 newspapers competing, according to contest chair-man and the association’s 2nd vice president, Joyce Hauk. Elected for the 2016-17 officer terms are Kathy Cooke, Rockdale Reporter, chairman of the board; Kim Jung, Fredericksburg Standard, President; Joyce Hauk, Copperas Cove Banner, first vice president; Chris Maher, Kingsville Record, second vice president; Jeff Berger, Hondo Anvil-Herald, secretary-treasurer; Mary Henkel Judson, Port Aransas South Jetty and Larry Jackson, Fayette County Record (ret. ), Assistants to the president; Sam Fore Keach, Robstown Record (ret. ), historian; Chad Ferguson, Columbus Banner Press, site selection Chairman; Lisa Walter, Fredericksburg Standard Radio Post, media services chairman; Cyndy Slovak-Barton, Hays Free Press, internship chairman and directors (terms expiring 2017) Sue Brown, sponsorship chairman, Pleasanton Express; Jason Jarrett, scholarship chairman, Westlake Picayune; Karen Lopez, Sealy News; (terms expiring 2018) Melissa Williams Perner, Ozona Stockman; Diane Cosgrove, Hondo Anvil- Herald; Bill Martin, Rockdale Reporter; (terms expiring 2018) Regina Keilers, Fayette County Record; Dan Parker, Port Aransas South Jetty and Ken Cooke, Fredericksburg Standard Radio Post round out the board. We were extremely proud of the Pleasanton Express wins. We competed neck to neck with two of Texas strongest weekly newspapers which are located in popular destination towns – the Fredericksburg Standard and the Port Aransas South Jetty. Our staff is truly a group of award winning talented professionals. The South Texas Press Association annual bulletin, courtesy of the Rockdale Reporter staff, featured a cartoon rendering of Wild Bill Wilkerson, on its cover drawn by Express editor Sue Brown. A two-page memorial was included inside the publication, in memory of the Pleasanton Express co-publisher who passed away on April 30 last year. The Sweepstakes award, given to all three contest divisions, will now bear the name Judy and Bill Wilkerson Sweepstakes Award for years to come.